SINGAPORE (Reuters) - Just over a year into production cuts lead by OPEC and Russia, oil markets in Asia have tightened noticeably as significant amounts of excess crude have been taken off tankers used for storage and delivered to customers across the region. Shipping data shows about 15 super-tankers are currently filled with oil floating off the coasts of Singapore and surrounding Malaysia, Asia’s main trading and storage hub for crude coming from the Middle East to Asia. That’s slightly less than last November, and half the number of tankers used for storage in mid-2017. 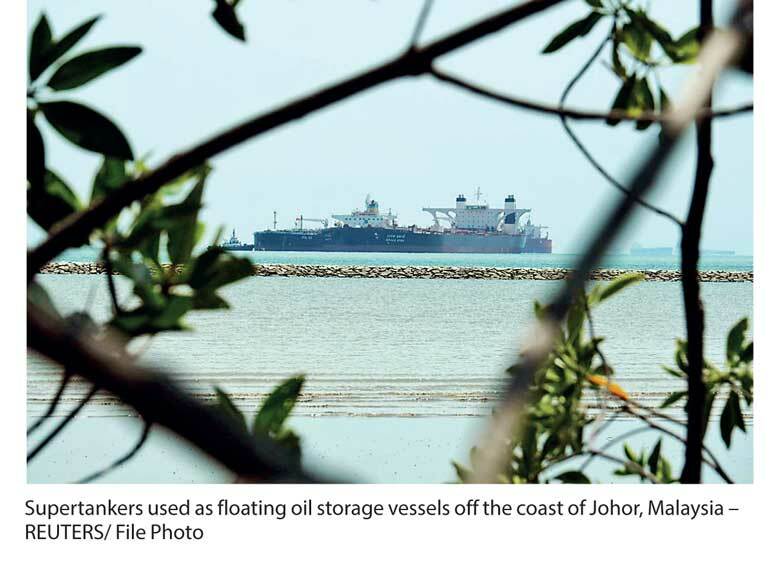 Traders say onshore tanks in the region, including at Vopak’s site in Johor, Malaysia, are also not booked out any more, marking a turnaround from 2016/17 when a situation known as tank-top was feared in which oil markets are so bloated that they run out of storage. The fall in storage is a sign production restraint started by the Organization of the Petroleum Exporting Countries (OPEC) and allies including Russia in January 2017 is having the intended effect of reducing a global glut. The main impact of OPEC withholding supplies has been to change the structure of the oil price curve. During oversupply, crude prices for immediate delivery tend to be lower than those for later dispatch, a market structure known as contango that gives traders an incentive to store oil for later sale. With markets now tighter, spot prices are more expensive than those for later delivery, removing the incentive. “Most of the contango stocks afloat are sold,” said Oystein Berentsen, director for crude trading at Strong Petroleum in Singapore. The oil price curve shows spot prices to be almost $4 per barrel above those for delivery this time next year. “Floating storage is no longer economical,” Berentsen said. What’s more, shipping data shows the majority of tankers storing oil around Singapore are only part full. In 2016/17, by contrast, the armada of tankers was filled to the rims. The main factors that could flip oil markets back into oversupply are an end to OPEC’s and Russia’s production restraint and soaring U.S. output. But Saudi Arabia, OPEC’s de-facto leader, says it is committed to withholding production. “If we have to err on over-balancing the market a little bit, so be it,” Saudi Energy Minister Khalid al-Falih said on Wednesday. U.S. output, however, is rising fast and its exports are increasingly appearing in Asia. U.S. crude production hit a fresh record of 10.27 million barrels per day this month, more than top exporter Saudi Arabia pumps, and within reach of top producer Russia. The International Energy Agency warned this week that supplies may start overtaking demand growth again later this year.